Kick back and relax on an overnight trip to Mykonos, an idyllic Greek island with a reputation as the Aegean party capital! Relax by the beach, discover rustic architecture in island villages such as Little Venice or perhaps visit the nearby UNESCO-listed island of Delos. The trip is independent, meaning no activities, excursions or meals are included  just ample free time to explore at your own pace and expense. A round-trip ferry crossing from Piraeus Port in Athens is included, as well as overnight accommodation in your choice of 3- or 4-star hotel. Start your trip to Mykonos with a pickup from your central Athens hotel in the early morning, and travel to Piraeus Port. Board your ferry and relax on the 4-hour crossing to Mykonos, a tiny island that forms part of the Cyclades island chain. Perhaps take a seat out on deck and catch some of the Aegean sun and scenery as you travel! Once docked at Mykonos port, travel to your 3- or 4-star hotel, check in and then spend the rest of your day at leisure. Perhaps take a stroll around the island to discover its rustic windmills, whitewashed houses and churches, or bask on a beach until the sun goes down. The island comes to life at night, so head out to experience Mykonos acclaimed tavernas, bars and nightclubs. Party the night away or perhaps enjoy a quieter evening stroll along the waterfront, and ogle the mega-yachts and glitzy boats that line the harbor. After breakfast, check out of your hotel, and then spend the morning and afternoon doing whatever you wish. Make the most of the Mykonos sunshine by lounging on one of the islands idyllic gold-sand beaches such as Elias Beach. 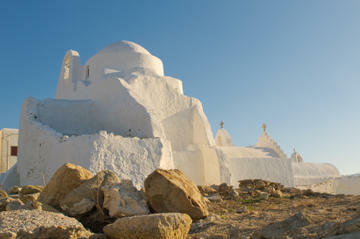 Or if culture is more your thing, Mykonos boasts several museums as well as the beautiful Church of Panagia Paraportiani. Admire the churchs interior and then stroll down to the quaint neighborhood of Little Venice, where pretty blue-and-white houses teeter on the waters edge. If you want to explore farther afield, why not head out on an optional excursion to the nearby island of Delos? Lying just 30 minutes away from Mykonos, the ancient island is rich in Greek mythological history, and is often pinpointed as the birthplace of Greek gods Artmenis and Apollo. Awarded UNESCO World Heritage status for its array of ancient temples and sanctuaries, the island is well worth a visit to complement your Mykonos experience. Your ferry crossing back to Athens leaves in the late afternoon, so return to your hotel at the prearranged time for your transfer to Mykonos port. After cruising back to Piraeus Port, finish your experience with a hotel drop-off in central Athens in the evening.